Succulent oven roasted, pancetta wrapped chicken breasts, served on top of a creamy risotto.This dish brings you all the heart warming flavours of Italy. Ideal for an intimate supper for two, served alongside a crisp green romaine lettuce salad, and a glass of prosecco sparkling wine. Heat the oven to 200°C/400°F. Season each chicken breast well, with salt and pepper. On chopping board lay out 3 strips of pancetta, side by side, slightly overlapping. Place a chicken breast at one end of the strips, and roll up the chicken, bringing the pancetta with it so that the pancetta is wrapped around it. Repeat with the other breast. In an oven-proof sauté pan, heat some oil, and place in the pan the wrapped chicken breasts with the side that has the edge of the pancetta, downwards. Sauté the pancetta wrapped chicken breasts until they are nicely browned. When brown add the chicken stock to pan, place in the oven and cook for 15 minutes. When cooked, remove from the pan and place on a warm plate, covered in a foil tent. Heat the oil in a pan and add the shallots, cook gently for 1 minute, and then add the garlic and celery. Cook until the shallot is soft. Be careful not to burn or colour the shallots or garlic. Add the rice to the pan and stir well to ensure that the rice has an even coating of oil, cook gently for 1 minute. Add the Vermouth, turn up the heat a little, and cook for 1 minute to evaporate off the alcohol. Now add a ladelful of stock to the rice and stir continuously until this has been absorbed. Continue adding more stock and stirring, until the rice is cooked. The rice should still have a slight bite to it, and be a little soupy, not dry. Now add the parmesan cheese, peas, broad beans, basil, the knob of butter, crème fraiche, and a seasoning of salt and black pepper, and mix well. Lastly, add the asparagus to the rice mix and cover the pan. Let it stand for 5 minutes to allow the flavours to develop. Server the risotto in individual bowls. 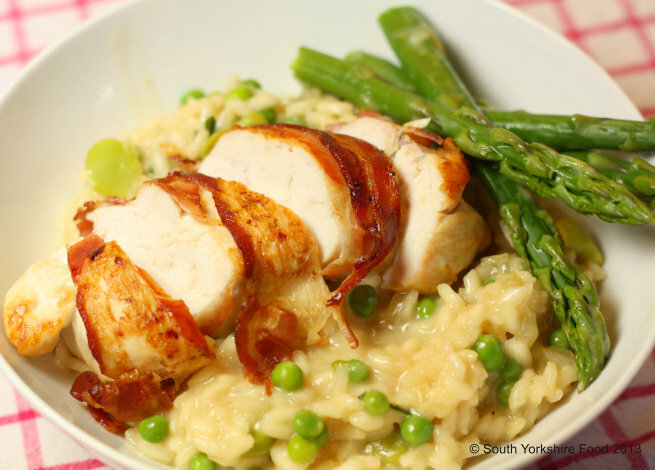 Slice the chicken diagonally across and place on top of the risotto, garnished with the asparagus.